From Our Hearts: A helicopter ride is pretty dang spectacular in itself, but when you add the professional and down to earth crew at Konect, you will get a wedding day experience like no other. 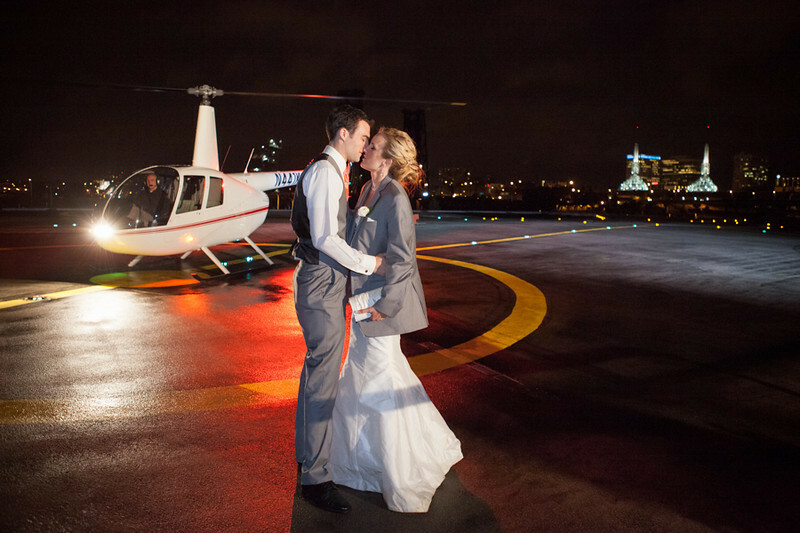 Why They Stand Out: There is nothing more amazing than getting the VIP treatment and leaving your wedding in a helicopter. The flight to Portland Downtown is amazing and perfect end to a perfect day. Your first moments alone together relaxing in the helicopter is an experience we would like every couple to have. Piece of Advice: Rely on the tips and expertise of the vendors to help you out. From Their Hearts: They are great, friendly, professional people, who are easy to work with. Our partnership makes for a great experience. What a Deal! : $662.50 for helicopter transportation from the Oasis to Portland Downtown including sparkling wine to celebrate the night after you arrive in Portland.